That's hella confusing, even for adults. Rin either settles in really fast, or some time had passed when the episode began, because she seemed entirely comfortable in her nursery lifestyle. The other children questioned her on where her mother was, since it was always her father that picked her up, to which Rin cheekily responded that Daikichi wasn't her father and, instead, "Grandpa" was her father. That's pretty confusing, to be honest. 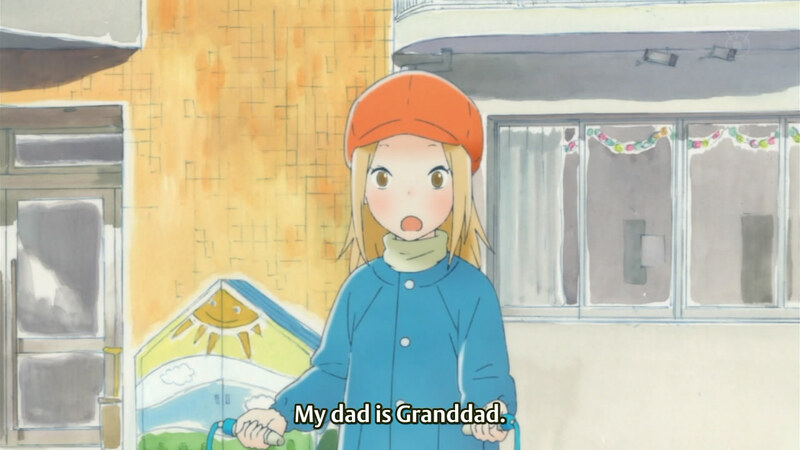 I wonder why Rin called her father that; perhaps it had to do with the age and what society would think when they were seen together? 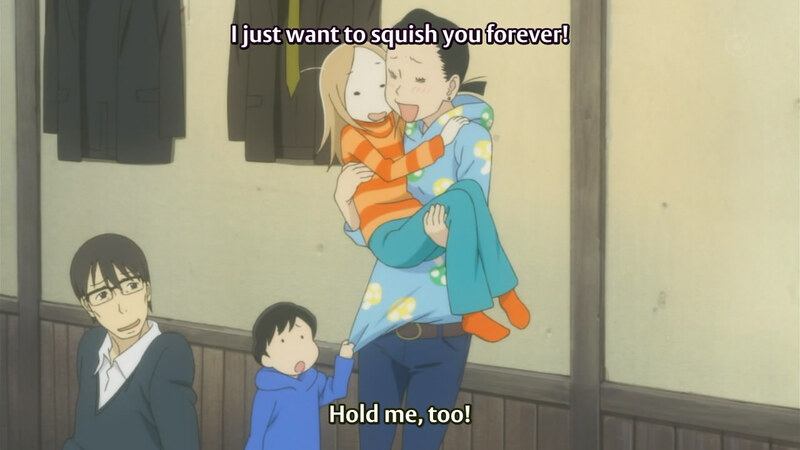 Damn, already in love with Kouki's mother. 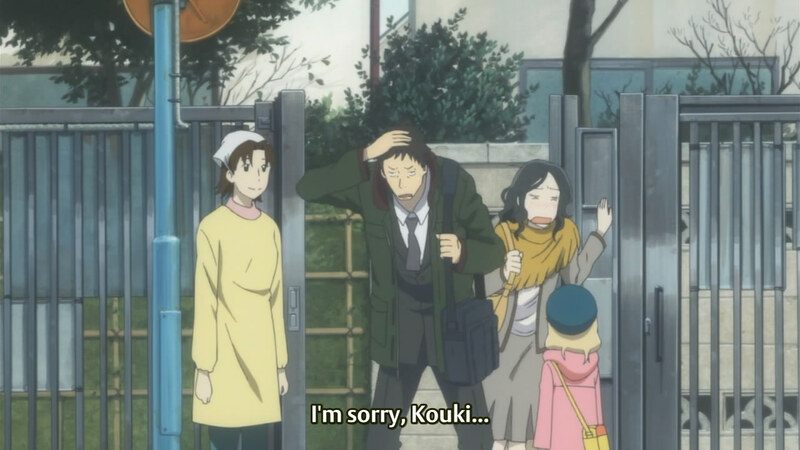 This scene was also the introduction of Rin's friend, Kouki. He seems a little more important to the story than being just a random school friend, not only because his mother was introduced, but also because he doesn't seem to have a father. He stood up for Rin when the other children insisted that she needed to have a father, essentially stating that he didn't have one and it was fine. He introduced the concept of "divorce" to Rin, which she relayed to Daikichi...who already seemed pretty taken with Kouki's mother (what is her name...?). I wonder if it's the kind of "taken" that involves romance, or the kind where he's looking up to another single parent that has done it for longer than he. Daikichi seemed settled into his new position, but his old subordinate (the one who had had an emotional outburst upon hearing that Daikichi was shifting departments) dropped by to let him know of a farewell party that they would be holding for him. It's nice to see that Daikichi is surrounded by other parents; it's definitely hard to adjust to a new lifestyle when people who don't understand are around you. It's also nice to see that Daikichi's being taught to "have fun" every once in a while. It's good that he's not a smoker and drinker any more, but it's not really right to give up your entire life for a child. Such is the problem facing many parents, who are unable to remember what they did before, for themselves, once they become empty-nesters. Not in front of your own child...! I was a little worried when Daikichi took Rin along with him to the party, since there would be alcohol, but it was nice that she had some company (in the form of Gotou's son) and the co-workers were extremely nice to her. I did find the idea that some of the co-workers were badmouthing him behind his back (while hanging out in the washroom) very, very annoying; it's really close-minded to think that a person needs to have the same priorities as you. In fact, it's better that Daikichi got out of the department before other large projects began; it would be irresponsible to leave in the middle of something. I wonder what it says about me that I would want to burst into the washroom, "with guns blazing", while Daikichi thought the fact that he would refrain was the sign of a better him. Foreshadowing to the future when they'll come together? Despite the way that she was portrayed, I really didn't like the entire concept. 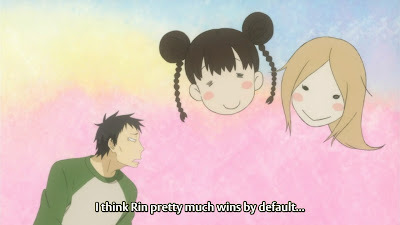 I understand that she was not ready for a child, and it's good that she recognized it (potentially never introducing herself as the mother to Rin herself, limiting the damage), but it's still pretty irresponsible. I don't know why she stuck around the house when she clearly didn't want to be associated in any way with Rin. Perhaps it was her feelings for the old man? That would make sense why she wanted to make sure that she couldn't be found should anything happen to him; that was the only thing tying her down. I can't help but feel that that kind of selfishness is unforgivable. At least the grandfather ended up leaving a will (although it didn't really explain what, if anything, was being left to Rin). Losing children. Every parent does it. 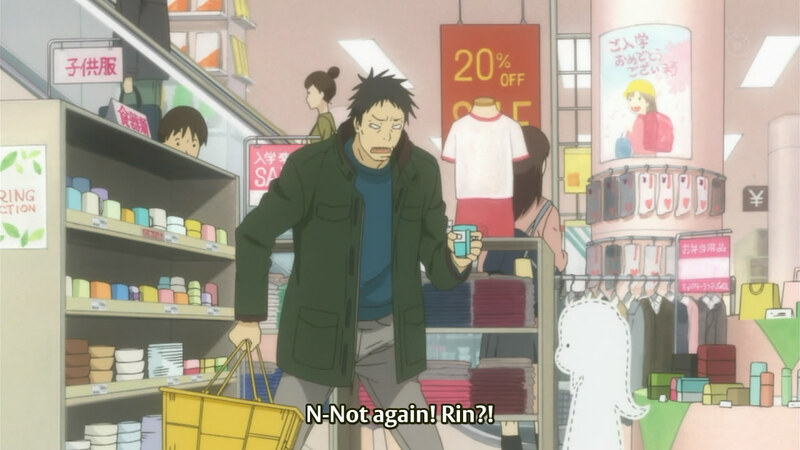 The episode ended with Daikichi pondering more about Masako, and then scenes of them buying various items as Rin hit the next milestone in her life: elementary school. 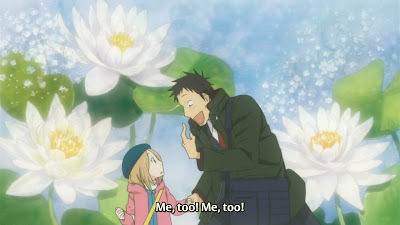 I can't imagine what the next episode would be about - obviously, Rin will actually begin school, but what about Masako? 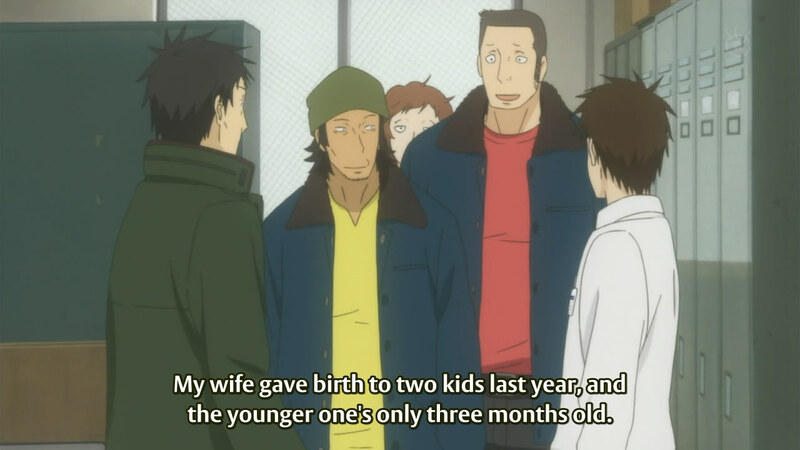 Kouki's mother? So many questions~ At least it's an anime that's drawing me in; I'm excited to see more growth from all the characters.